"Virginia Barkeley is a nice, well brought-up girl. So what is she doing wandering through a snow storm in the middle of the night, blind drunk and covered in someone else's blood? When Claude Margolis' body is found a quarter of a mile away with half-a-dozen stab wounds to the neck, suddenly Virginia doesn't seem such a nice girl after all. This was my surprise book post of the year and one that really excited me. I have long been a fan of Millar's work which unfortunately has fallen out of print over the years. The years between 1952 and 1962 are known as Millar at her zenith, when she produced her most famous and innovative work. 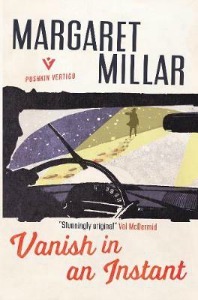 'Vanish in an Instant' was the first of this work, published in 1952 and has a wonderful twist that she was to become well known for with her other work, 'Beast in View' for which she won the Edgar for Best Crime Novel and 'The Soft Talkers' (aka 'An Air That Kills'), 'The Listening Walls', 'A Stranger in My Grave' and 'How Like An Angel', the latter being one of my favourites. Millar was never really accepted in the U.S., and like Patricia Highsmith, her work was more successful and celebrated in Europe. I have pushed many of Millar's books on friends, especially crime writers who have loved Millar's books and been astounded that Millar and her books have faded in to obscurity. It seems that now she is having a Renaissance, and about time, too! Her fans included Agatha Christie and Dorothy B. Hughes, although her best critic was Raymond Chandler who loved her work. As like Chandler, Millar never wasted a single word or sentence and her tight psychological plots are a joy to read time and time again. This is definitely one to read over the festive season." Christie knew that if you wanted to crank up the suspense, then a group of people stranded on a remote island is perfect for tightening and heightening atmosphere. 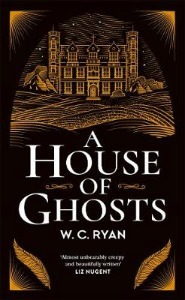 The same can be said for this new book from Ryan which is on a remote island during war-torn Britain in 1917, with a seance on the cards and many souls stalking the bleak landscape. As the guests gather, a storm gathers and one of them will die. This is very atmospheric stuff and with the crossover of ghosts and death, this is a highly entertaining book which would be perfect for any Christmas stocking. Guaranteed to keep any book lover quiet for hours! Click on the link to read our review of A House of Ghosts." "For me, Fremlin sits alongside with Margaret Millar in the category of great suspense writers who disappeared from our book shelves. Thankfully, Faber re-issued her books under the Faber Finds motif and then re-issued her most famous book, 'The Hours Before Dawn' (1958) for which Fremlin won the Edgar for Best Crime Novel in 1960. 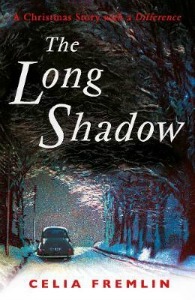 Now, Faber have given a atmospheric cover for her Christmas suspense novel, 'The Long Shadow'. Although this is not a story filled with the festive season, this is about Imogen whose husband, Ivor died in a car crash two months ago. Having to deal with sudden widowhood, Imogen is now receiving menacing phone calls accusing her of killing her husband. Strange things start to happen around her house as guests start to arrive for Christmastime. Is it one of her guests who has a grudge to bear? Is it someone as yet unknown to her? Fremlin is perfect at exploiting the family dynamic and how the relationships between family members can be more confusing and convoluted than expected. This is another dark suspense novel from the menacing pen of Fremlin. As with Millar, it is wonderful to see this author who has an acute and precise eye for detail, back in print." "The Christmas Crime anthology seemed to have gone out of fashion for many years. With the huge success of the Crime Classic Series from the British Library, these have rightly again become a part of our Christmas festivities. 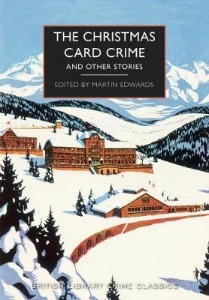 Editor, Martin Edwards has again plumbed the depths for wonderfully obscure Christmas crime stories that have not seen print for decades. Here, Edwards gathers together stories by Barroness Orczy, Cyril Hare, Julian Symons, E.R.C. Lorac, Ronald Knox and Francis Durbridge along with a few by writers I had never heard of. 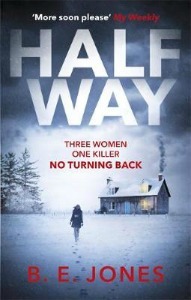 This is a wonderful buffet of Christmas delights that will thrill any crime reader." "When Dorothea's charitable work leads her to Oakgate Prison, she is delighted to have the chance to explore her fascination with phrenology and test her hypothesis that the shape of a person's skull can cast a light on their darkest crimes. But when she meets teenage seamstress Ruth, she is faced with another theory: that it is possible to kill with a needle and thread. For Ruth attributes her crimes to a supernatural power inherent in her stitches. 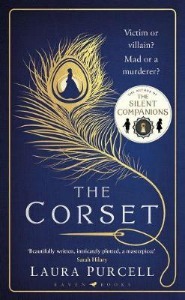 I loved Purcell's debut, 'The Silent Companions' and am pleased to see that again she has gone down the supernatural route for her second book. But as with her last, is everything as it first appears? For those who love Susan Hill's ghost stories, this is a perfect present to find under the Christmas tree." This is the dark horse of my Top Ten. I just loved the premise of Jones' story. As with Ryan's novel above, there is nothing better than a bunch of strangers held captive by the weather as a killer stalks the hallways. Always a good start to any thriller." 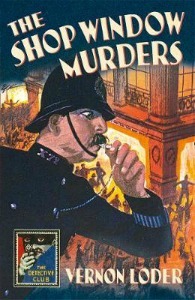 This crime mystery was first published in 1930 and is now re-issued under The Detective Club banner. Allegedly Mander's Department Store was based on Selfridge's when it was a big part of the festive calendar when their Christmas displays were unveiled. Here, the display is anything but festive. Loder is another of the Golden Age writers who disappeared from print and now he is back after many decades. Inspector Devenish uncovers the dastardly doings at Mander's and this was to be his only appearance. This truly is a marvellous Golden Age mystery and it is great that this is now back in print - and just in time for Christmas. These natty little hardbacks make up a great collection of forgotten authors from that era and come in at a very reasonable price, too!" "Clare Cassidy is no stranger to tales of murder. As a literature teacher specialising in the Gothic writer R.M. Holland, she teaches a short course on them every year. Then Clare's life and work collide tragically when one of her colleagues is found dead, a line from an R.M. Holland story by her body. The investigating police detective is convinced the writer's works somehow hold the key to the case. It appears that Elly Griffiths can do no wrong and brings us yet another stunning and addictive Gothic masterpiece. This standalone from the creative pen of Griffiths shows this author's imagination will wander anywhere and isn't worried about dealing with new realms of fear and suspense. We loved this book and I am sure you or the recipient will also love it, too! 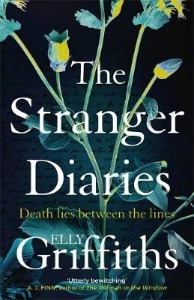 Click on the link to read our review of The Stranger Diaries." "Edgar Laplante was a smalltime grifter, an erstwhile vaudeville performer, and an unabashed charmer. But after years of playing thankless gigs and traveling with medicine shows, he decided to undertake the most demanding and bravura performance of his life. In the fall of 1917, Laplante reinvented himself as Chief White Elk: war hero, sports star, civil rights campaigner, Cherokee nation leader--and total fraud. They say that fact is stranger than fiction and that saying cannot be more truer than in the case of Edgar Laplante. This guy was a con artist extraordinaire and boy, did he manage to pull the wool over many peoples' eyes - and make a massive fortune at the same time. 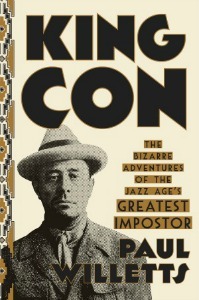 Even if you are not a fan of biographies, you must read this one as it is astounding the scams Mr Laplante got up to! A fascinating read." "It is the week before Christmas and the cathedral city of St Albans is blanketed by snow. But beneath the festive lights, darkness is stirring. 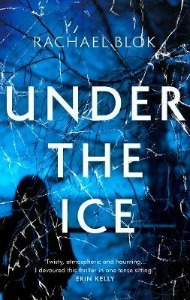 The frozen body of a young girl is discovered by the ice-covered lake. A local woman, Jenny, has had visions of what happened the night of the murder. But Jenny is an exhausted new mother, whose midnight wanderings pull her ever closer to the lake. Can Jenny be trusted? What does she really know? In her debut, Blok wonderfully weaves the supernatural with police procedural. Jenny is a new mother and tired. Is she having visions? Or is it simply exhaustion? Maarten leads the investigation and soon Jenny's involvement in the killing deepens. This is an excellent debut that is full of atmosphere. With only her debut, Blok shows she has a sharp eye for detail. 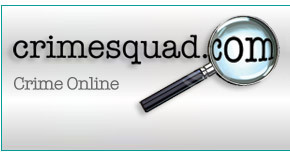 A name to remember in crime circles."